Allora Restaurant is located in a busy square off the main road in the heart of the Franschhoek Village. Allora has the look and feel of a traditional Italian village and can seat up to 120 guests on two levels and a lovely outside terrace (ideal for summer evenings). The kitchen is the heart of the home and the central wood-burning pizza oven is the heart of Allora Restaurant in Franschhoek. The style of Allora Restaurant is casual yet sophisticated and is closer to fine dining than most other contemporary Italian restaurants. The vibrant colours and the warm menu are truly in sync. White linen table cloths confirm the restaurants elegance – its décor eye-catching but not overbearing. The mix of simplicity and the ability to wed rustic flavours with modern culinary innovations will dazzle even the most refined palates. Each dish at Allora Restaurant is artistically arranged and vibrantly coloured. 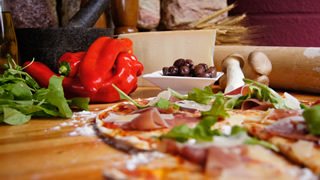 The Allora menu caters for the majority of client’s needs including meat, seafood, poultry, home-made pasta and thin based pizza’s. Vegetarians will be delighted with the number of delicious and creative choices.